When I was young, all I understood about the world was that you needed regular employment to survive and how more often than not, your job would be a sucky one. For the longest time it just never occurred to me that I could have a say in how I chose to provide for myself. I'd look at people who went to college and feel like their whole existence was foreign to me. That they were specially privileged in ways I could never hope to access. I can remember always being drawn to all things art related- wanting to spend as much time as possible in art class and around the art teachers in general but never imagining for even a second, that I myself could be like them. It just wasn't possible. During high school, I applied but was not accepted into the Vo-Tech Commercial Art program. I'd also sent away for college materials from the Art Institute of Philadelphia but the booklets went unnoticed by my Mom who was doing everything she could for the two of us to barely scrape by. (I knew nothing about college loans/scholarships.) Though I had been tested early in elementary school and been given the designation as "gifted" I was a highly unmotivated student who grew more and more uncomfortable with my surroundings until I would drop out of high school literally days following my 16th birthday. Soon after, I'd start my first full-time job having moved out of my house to live with a boyfriend. The three jobs I'd work for the next 24 years paid little and had no real room for advancement, but in every scenario I'd learn as much as possible, mostly because I get bored easily and have the need to be continuously challenged. In that time I'd learn retail sales, photography, photo-finishing on a mini-lab, customer service, merchandise display, order picking/shipping, inventory control, how to use a computer, accounts receivable, commercial collections, relationship building, how to write training manuals... In my spare time I'd learn to sell on Ebay, then started my own business making and selling jewelry at craft shows and art festivals. I'd facilitate drum circles and organize events for other facilitators, all of which included the marketing of said events via internet user groups and social media sites. I'd build websites for myself and help others maintain their web presence. I learned to play percussion and would play local festivals with a drumming group. All while working a full-time job, I'd also begin helping a friend write a book. November of 2008 was the first time I'd come to really recognize and accept that it was possible for me to become fully self employed. That I could, and would, always figure out how to do whatever it takes because that's what I'd been doing all along to survive. Now I would just be doing it for me. Once I set myself free, I'd continue helping my friend with his book for another year or so and would also start writing for Rhodia Drive. I'd also develop and begin to facilitate my art empowerment workshops and be invited to teach them at retreats in PA and NY. I'd begin to sell my art on Etsy and then one day, I had an idea to apply to become an artist in residence at a local arts & education center - which I would be granted just about a year ago. Another November anniversary. 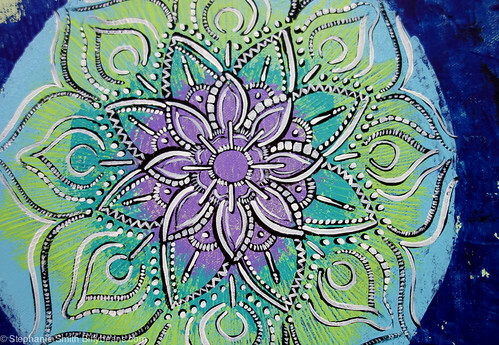 The mandalas first started for me six years ago as a self-soothing exercise- a creative meditation which through their ever expanding rhythms and patterns, would help me gain focus and clarity to help transform outdated ways of thinking. (I quit my job, quit smoking, learned Reiki I & II, got my GED...) They would also allow me to connect with a higher part of myself which would in turn, make me feel whole. 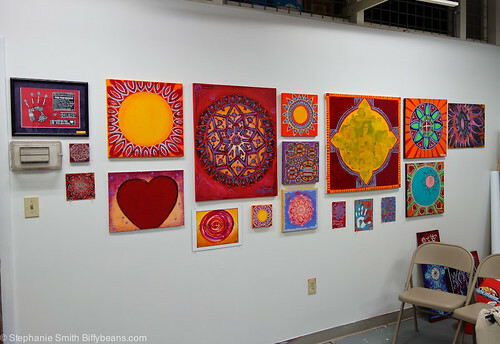 While researching material for my workshops, I'd learn how mandalas are utilized across the globe for a wide variety of cultural and religious purposes - defining my own creations as process based and spiritual/therapeutic in nature. My initial pleasure was in the creation itself- in the experimentation of the form in all different kinds of media with no real fixed notion on an outcome. (Despite the fact that their quality was improving due to the sheer quantity I was producing - literally thousands...) Up until the spring of 2011, I had not "shown" any of my work locally - it had all been accessible on the web which at the time felt very freeing, but in retrospect, was pretty safe. The most confusing aspect of my current artistic life pertains to my expressions and how they may be influenced by my perceived need for my "self-employment" to be sustainable. I'll find myself creating complimentary pieces which in turn allows for a pleasing display in my studio, but I don't know whether or not that's driven by my retail background or a refined artistic sense which has developed as part of my over all "process." The painting at the top of this post is entitled "A New World" and is available for purchase in my Etsy shop. In celebration of my 4 year anniversary as an independent artist, I'm offering FREE US SHIPPING on everything in my Etsy shop from now through 11/23. Simply enter the code 4YEARS at checkout.